Paris Mourns Heroes of the Pen by Ronald C. Rosbottom. © 2015 Ronald C. Rosbottom. Published with permission. All rights reserved. Read in part at the American Library in Paris on January 15, 2015 in Paris. (French) Ronald C. Rosbottom, author of the bestseller When Paris Went Dark, is the key person to talk to about Paris having gone dark once more considering the tragic attack at the Charlie Hebdo headquarters earlier this year. Ronald’s letter to colleagues and friends captures the terror and humiliation that was Paris. We feel When Paris Went Dark: The City of Light Under German Occupation, 1940-1944, is timelier than ever. One of you, hearing of yesterday’s attack at the headquarters of Charlie Hebdo, a satirical weekly here in Paris, wrote: “Are you safe?” The answer is yes, we are, but we do not live in safe times. We were in a restaurant at lunch yesterday on the Left Bank, when one of our friends read from her cell phone that there had been an armed attack near the Place des Vosges in the Marais where we often shop and dine. We asked the waiters if they had more news, but they were as uninformed as we. My wife, Betty, and I decided nevertheless to go to the Marais where we had planned to spend the afternoon. We stopped in a café to watch TV, and the news was stunning: a dozen people, ten of them journalists, cartoonists, and staff for the paper, had been gunned down just before noon. Amateur videos showed two masked killers getting into a car, but not before shooting a wounded policeman in the head. The news spread quickly throughout the city, and everywhere we went on our way home Parisians were checking their cell phones for more information. Within hours, thousands had gathered spontaneously at the Place de la République, the square that has served as a rallying spot for all sorts of public support for the rights of man. We saw on TV hundreds of people holding candles, signs that read “Je suis Charlie,” but, more poignantly, holding up their pencils, their Bics, their fountain pens, in sympathy with those journalists who had joyfully, satirically, and often “tastelessly,” mocked the religious and political opinions of the certain. Today, it’s raining in Paris, as crowds gather in front of Notre Dame Cathedral, again in the Place de la République, and elsewhere throughout the city and the country. President Hollande has declared a rare three-day period of national mourning. The rain only reinforces the sense of mournfulness that covers this beautiful city. The 19th-century poet Baudelaire wrote about such dismal times “quand le ciel bas et lourd pèse comme un couvercle/Sur l’esprit gémissant en proie aux longs ennuis,/Et que de l’horizon embrassant tout le cercle/Il nous verse un jour noir plus triste que les nuits.” [When the low and heavy sky weighs like a lid/Upon the soul moaning in injury,/And when, spanning the city’s horizon,/It pours a black day sadder than our nights”]. This is how Paris felt today when I went out to buy a dozen newspapers—of all political stripes—commenting on yesterday’s still resonant events. Paris represents many things for Betty and me: a joie de vivre, that is, a deep belief that life can be pleasant, that being with friends over a slow meal is the height of sophistication, that just watching others enjoy the city is entertainment enough, that there are so many small actions that Parisians take that add aesthetic comfort to daily existence. Yet these events remind us of another Parisian tradition, that of tolerance, belief in the curative power of intellectual engagement, criticism as a healthy antidote to smugness and comfort. Liberty is not an empty ideal here, but a palpable reality. Charlie Hebdo was not a great newspaper, nor a widely read one. Its most persistent impact came from the outrageous cartoons that its illustrators created, and which were picked up by media all over the world. Nothing was sacred; everyone’s beliefs were criticized. And, a few years ago, the paper’s offices had been fire-bombed, and its employees threatened. Most recently, the weekly had been relentless in its targeting of “radical Islam,” or of those who used one of the world’s largest religions for their own narrow purposes. In a formidable essay on Salon’s e-zine, Laura Miller wrote that “to kill someone for making fun of you is a tacit confession of your own impotence, a demonstration of the fragility of your self-respect and legitimacy.” Yet this felt impotence and sense of fragile legitimacy too frequently combine to create thoughtless and profane murderers. Thanks to countries like France, the light of reason will continue to show the rest of the world the way toward sanity. In one of those coincidences that make living so surprising, I had gone to the Marais to buy a Christmas gift I had promised myself: a beautiful fountain pen. I purchased it just a few hours after twelve people had died defending my right to use it as a critic. When Paris Went Dark: The City of Light Under German Occupation, 1940-1944 by Ronald C. Rosbottom. Long listed for the National Book Award, now in paperback. June 14, 1940, German tanks entered a silent and deserted Paris. The City of Light was occupied by the Third Reich. Parisians were stunned, humiliated, and yet curious about the sudden appearance of thousands of German soldiers on their boulevards. The Germans too were curious: How do you treat a city that did not fire a shot in its own defense? 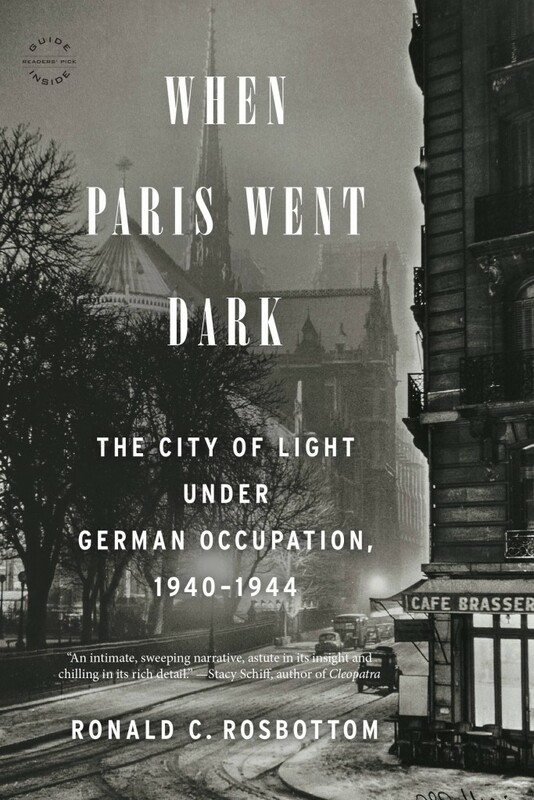 Celebrating more than 70 years since the Liberation of Paris, Ronald C. Rosbottom’s When Paris Went Dark: The City of Light Under German Occupation, 1940-1944 (Back Bay Books/Little, Brown and Company; March 17, 2015), now in paperback, weaves a rich tapestry of stories to help readers rediscover the texture of daily life in a city that looked the same but had lost much of its panache. Over the four years of the Occupation, an eerie sense of normalcy would settle over Paris as the occupiers and the occupied struggled to coexist. Excerpt: When Paris Went Dark: The City of Light Under German Occupation, 1940-1944 by Ronald C. Rosbottom. Copyright © 2014 by Ronald C. Rosbottom. Reprinted with permission of Little, Brown and Company (Part One)(Part Two). Interview: Ronald C. Rosbottom’s “When Paris Went Dark” – Marking the 70th anniversary of the Liberation of Paris (Part One) (Part Two) published on A Woman’s Paris®. 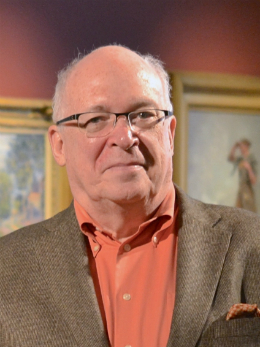 Ronald C. Rosbottom is the Winifred Arms Professor in the Arts and Humanities and a professor of French and European Studies at Amherst College. Previously he was the dean of the faculty at Amherst and the chair of the Romance Languages Department at Ohio State University. He lives in Amherst, Massachusetts. You may also enjoy A Woman’s Paris® post Anne Morgan’s war: American Women Rebuilding France, 1917-1924. Anne Morgan, daughter of the prominent financier J.Pierpont Morgan, and the 350 American Women—all volunteers—left comfortable lives in the United States to devote themselves to humanitarian aid in France; an account from the exhibition of photographs and silent films from the Franco-American Museum in Picardy, France. Château de Blérancourt, in Picardy, France was created by Anne Morgan and is today a national French museum devoted of friendship and collaboration between the United States and France. French Impressions: Barbara Will on Gertrude Stein, Bernard Faÿ, and the intellectual life during wartime France. From 1941 to 1943, Jewish American writer and avant-garde icon Gertrude Stein translated for an American audience thirty-two speeches in which Marshal Philippe Pétain, head of state for the collaborationist Vichy government, outlined the Vichy policy barring Jews and other “foreign elements” from the public sphere while calling for France to reconcile with its Nazi occupiers. In her book, Unlikely Collaboration: Gertrude Stein, Bernard Faÿ, and the Vichy Dilemma, Barbara Will outlines the formative powers of this relationship, treating their interaction as a case study of intellectual life during wartime France. French Impressions: Dr. Alan T. Marty on the dark history of the City of Light. Alan T. Marty, MD, armed with an historically-informed exploratory spirit, has often encountered Paris’ endless capacity to evoke a mood, to surprise with similar absent/present paradoxes, as detailed in his A Walking Guide to Occupied Paris: The Germans and Their Collaborators, a book-in-progress. His work has been acknowledged in Paris dans le Collaboration by Cecile Desprairies, Hal Vaughan’s book Sleeping with the Enemy: Coco Chanel’s Secret War; and referenced in Ronald Rosbottom’s When Paris Went Dark, and in an upcoming book about Occupied Paris by Tilar Mazzeo. Text copyright ©2015 Ronald C. Rosbottom. All rights reserved. This is a great report about the spirit and life in Paris at the time of the Charlie Hebdo attack and now. Bravo and thank you. Leave a reply on "Je suis Charlie: “Paris Mourns Heroes of the Pen” by Ronald C. Rosbottom"